Oreo got me up at eight this morning meaning that I only got about four hours of sleep. I am going to be pretty sleepy today. After Oreo’s walk I set out to the patisserie across the street to get some breakfast pastries and then to the Second Cup on the corner for some coffee. Second Cup has a large outdoor patio area where Oreo is allowed to hang out. So Dominica brought him over from the Quality Hotel and we sat outside enjoying the beautiful morning on the av du Parc in the heart of Montreal. Dominica was tempted by the lure of fresh quiche from the patisserie so she sent me back over to pick up some tomato, leek, basil and goat cheese quiche that they also heated up for us which we then took back to the hotel to eat. That was our breakfast. Oreo is limping a bit from what appears to be paw pain. We think that his constant pulling at his leash has caused him to develop raw paw pads so we are minimizing his walking today as much as possible. It is a bright and sunny day and he is very happy lounging in the plentiful sun spots in our hotel room at the Quality Hotel. Dominica and I are both exhausted today and are taking it extremely easy. We have no plans and it is Sunday so there is very little to do in town today anyway. Our plan was to just lounge as much as possible. I wasn’t hungry around lunch time so I skipped lunch but Dominica went down to the Werby’s in the hotel and got a big banana crepe. We had several short walks with Oreo throughout the day and watched some television. No naps though. For dinner, around six, we headed up the street just a little ways to try Thai Express which seems to be popular around here. I wish that I had taken this pic but this is one that I had to find on Flickr. 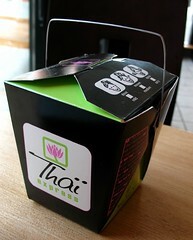 This is the take out containers from the Thai Express. I did some searching to find their website but to no avail. The good at Thai Express was quite good. The price was good and the quantities were huge. It was a ton of food. We definitely wish that we had one of these back home. After dinner we came back to the hotel. We thought about going out and exploring the Montreal Underground but discovered that it is closed today because it is Sunday and it might not be open tomorrow because of the holiday. So since we were tired and since my left heel is killing me – we have no idea what is wrong with it but for about two months now the pain has been pretty bad – we decided to just stay in and watch some television and then to go to bed early. Tomorrow the plan is to leave Monteal around noonish to head back south towards New Jersey. I am hoping that we might get a chance to stop in Plattsburgh for a little bit as I have never stopped there as far as I can remember and I would like to see the port on Lake Champlain.